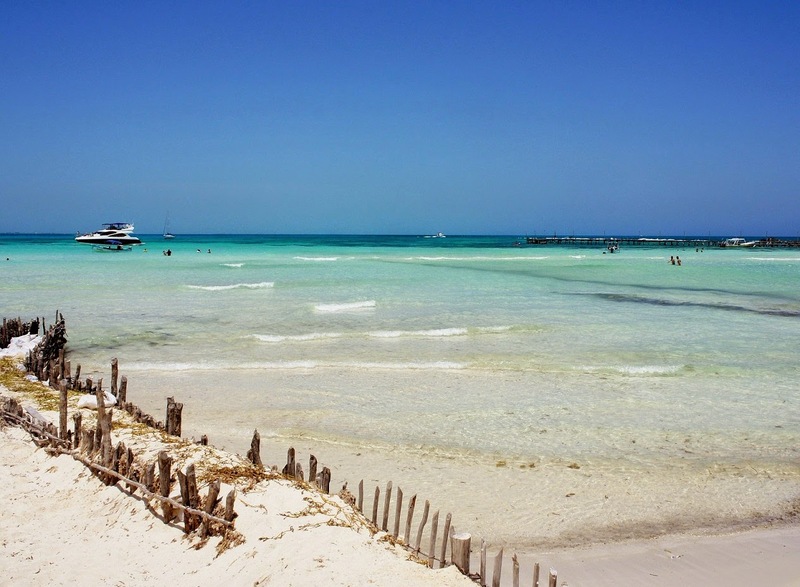 So, you’ve been to Isla a time or two and are getting slightly bored with hanging out at the beach all day. It might be a perfect time for you to explore, by golf cart, moto or bicycle, some of the local neighbourhoods instead of following the usual route along the perimeter road. A decent map will help with your explorations. Laura McFarlin – the MapChick – produces a handy-dandy map and travel guide for the island. Her map is available for sale at the hotel reception office of Marina Paraiso, located on Rueda Medina just a couple of minutes south of the whale shark statue. While you are at the office purchasing your map you might want to make a quick stop at Barlito’s @ Marina Paraiso for a coffee and one of Brad’s almost-world-famous Cinnamon Buns. Yum! Raisins, cinnamon, icing – three of our favourite food groups! Okay, got your supplies? Camera? Bottled water? Then let’s go. Head south along Rueda Medina, until you see the naval housing complex on the left side of the road. It is painted bright orange with a tall white perimeter fence, and a guard at the gate. Turn left at the next street and slowly weave your way up and down the short blocks of the Caridad del Cobra and Canotal neighbourhoods. 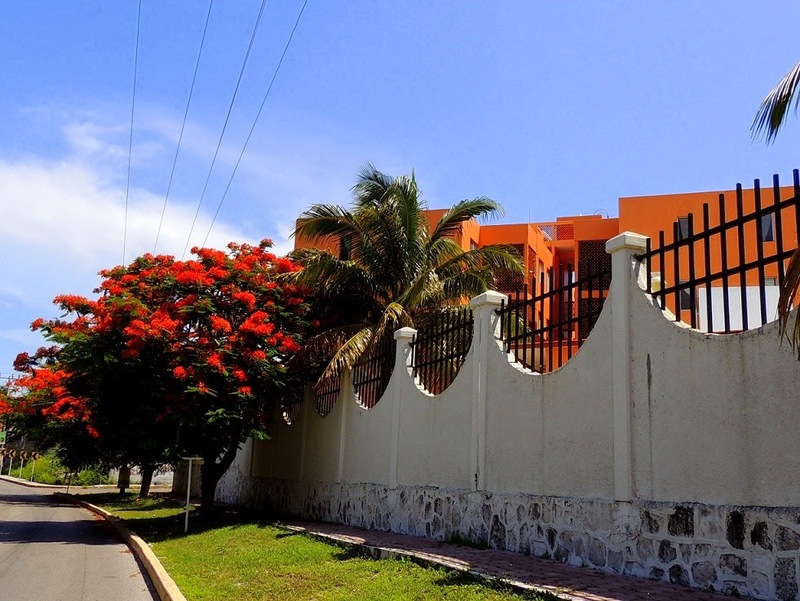 Located between the Salinas Grande (a land-locked salty lake) and the perimeter road this is a quiet residential area. Please be respectful and keep a sharp eye out for kids, cats and dogs playing in the roadway. A number of the roads will dead-end at the salinas or turn into pedestrian pathways necessitating turning around and retracing your route to the next through-street. 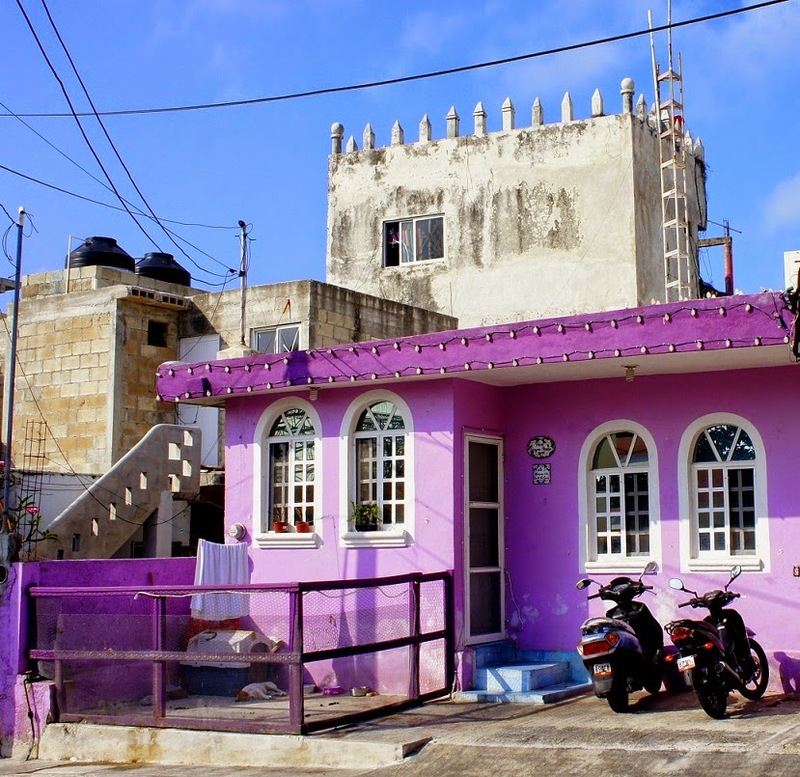 Many of the houses in these two neighbourhoods are painted in eye-catching colour combinations of pink, purple, green, yellow, turquoise, or orange. 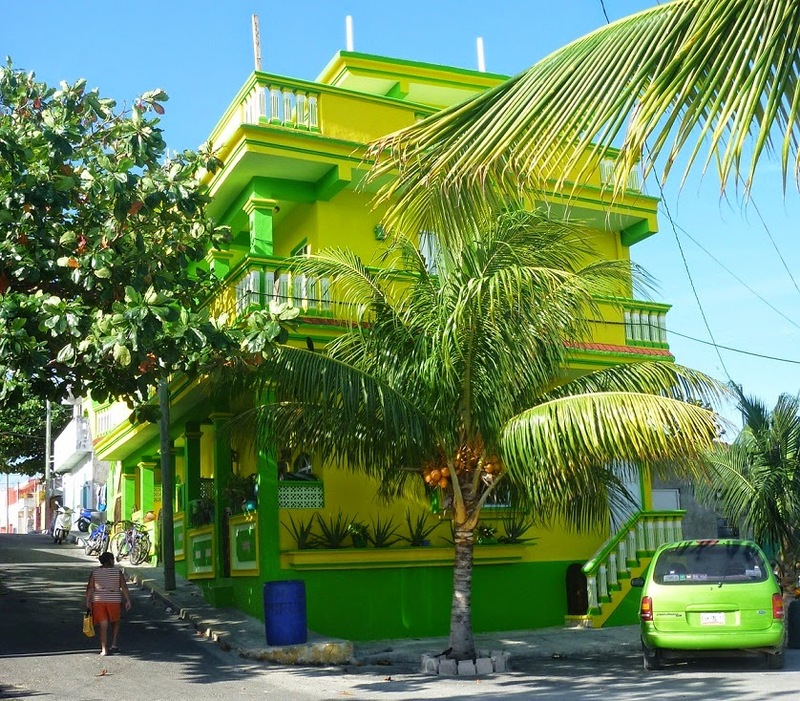 Most of the really colourful houses seem to be on the streets with bird names; streets named Flamenco, Fragata, Garza Azul, Garza Blanca, Cormoran, and Aquila. I also discovered a few on Manglero (Raccoon Street). Unfortunately not all the streets have visible signage. Time + sea salt = disintegration of everything metal. Don’t assume you will always find a name for the road you are driving on. Our road-trip theory has always been: if you don’t know where you are headed, you can’t get lost. Just enjoy the experience. And as we all know, driving in the tropical heat can be thirsty work. Oscar’s Pizza & Restaurante is on the main road, Rueda Medina. Along the roadside entrance are a dozen or so huge wooden chairs made from the trunks of trees with twisted branches forming the back and arms. It’s is a good place to have a cool beverage and if you are lucky enough to be there after 5:00 in the afternoon when Michael and the crew fire up the pizza ovens, well, the New York-style pizzas are amazing as are the delicious garlic knots. Garlic knots; another favourite food group in our house! Get out there and explore the island. You will be glad you did. Great photos to accompany this post! We love driving around with no destination in mind–we always enjoy where we end up! You're so dedicated to go to an internet cafe! 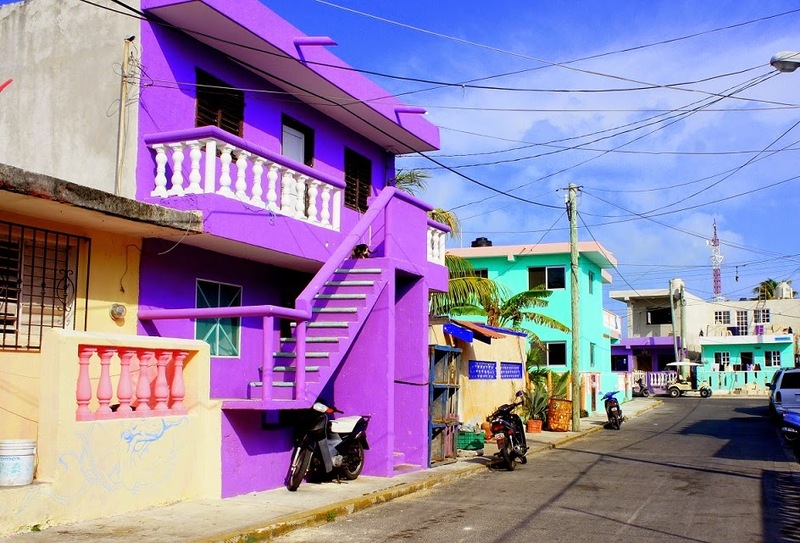 I recognize those houses from our month long stay a few years back in the colonias. Great post! I heard Isla finally got some rain!